Once again TIGO will be joining Raise The Jolly Roger for tonight's live chat. Join us. Most of the people that chat during the games are smart Pirates fans and know their stuff. And some are just punks. There's a lot of play by play stuff if you can't see the game. Sometimes there's too much of that and not enough "chatting". Help us change that. 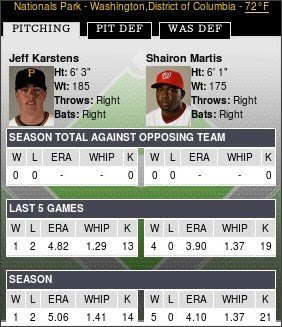 Here is the pitching match-up. The game is on FSN. Go Bucs!